Jason Avery Films did a wonderful job capturing The Legend Series Five on video. The Legends Series Five at Dee Dot Timberlands from Jason Avery Films on Vimeo. Jacksonville Magazine published a stunning article on The Legend Series Five in their March 2013 issue. The fifth event in The Legend Series took place the evening of Saturday, January 26th at Dee Dot Timberlands. The event was in partnership with Jim Draper and his Feast of Flowers project. Courses were prepared by Chef Sam Efron of Taverna; Chef Waylon Rivers from Black Sheep; Chef Tom Gray of Moxie Kitchen + Cocktails; Chef Scotty Schwartz of 29 South; and Chef Brian Siebenschuh of Orsay. 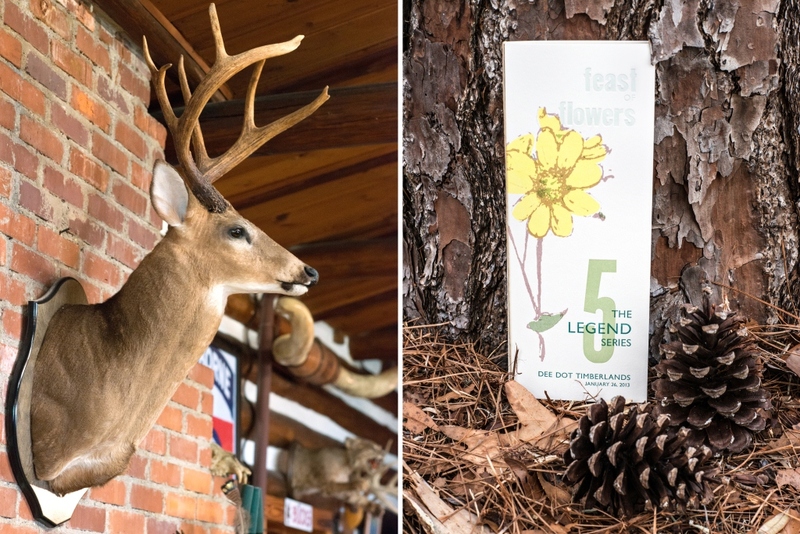 The meats were hunted at Dee Dot Timberlands and the greens, herbs and spices were foraged in the woods and wilds of Northeast Florida by Asheville-based wildharvesters Katrina Zoe Norbom and Eric Hawes. Each course was paired with beer from Intuition Ale Works, which sponsored the event. Guests were entertained by Braided Light Dance Project and cellist Na’arah Strokosch. Photos courtesy Agnes Lopez of Pose Well Studios. The event will be featured in the March issue of Jacksonville Magazine. The fouth event in The Legend Series took place at The Florida Theatre the evening of Sunday, December 2nd. Courses were prepared by Chef Sam Efron of Taverna; Chef Guy Ferri from Black Sheep; Chef Tom Gray; Chef Scotty Schwartz of 29 South; and Chef Brian Siebenschuh of Orsay. Guests were entertained by singers from First Coast Opera. The event was sponsored by Augustan Wine Imports and Intuition Ale Works. Photos courtesy Laura Evans Photography. Read a behind-the-scenes account of the event in the Jacksonville Business Journal. The event will be featured in upcoming issues of Arbus Magazine and EU Jacksonville. If you would like to receive information about future events in The Legend Series please visit https://thelegendseriesjax.com/attend/. The Legend Series Three at the Brumos Collection is featured in the Oct/ November issue of Arbus Magazine. The third event in The Legend Series took place at The Brumos Collection the evening of Sunday, August 26th. Courses were prepared by Chef Sam Efron of Taverna; Chef Tom Gray from Bistro Aix; Chef Scotty Schwartz of 29 South; Chef Brian Siebenschuh of Orsay; Chef Mike Ramsey from Jacksonville Golf & Country Club; and Chef Caitlin Schneider-Franz from Jacksonville Golf & Country Club. Augustan Wine Imports sponsored the spirits and wine and Intuition Ale Works donated all the beer for the evening. Guests were entertained by dancers from The Florida Ballet accompanied by Philip Pan on violin and Rhonda Cassano on flute. If you would like to receive information about future events in The Legend Series email thelegendseriesjax@gmail.com. The Legend Series Two at the old Ford assembly plant is featured in the July/ August 2012 issue of Arbus Magazine.